A song sung by Shankar Mahadevan and music composed by Shankar Ehsaan Loy. Features: Govinda, Urmila Matondkar, Suniel Shetty, Akshaye Khanna, Boman Irani, Swini Khara, Prem Chopra. 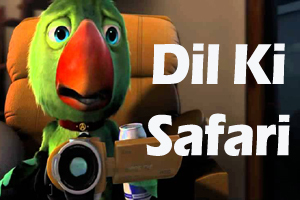 Lyrics of "Dil Ki Safari"
dil ki safari hai dilli safari ho. Lyrics in Hindi (Unicode) of "दिल की सफ़ारी"